The Society founded by a group of historically minded citizens in April 2002 with the purpose of assembling documents, artifacts and items of historical significance regarding our township. 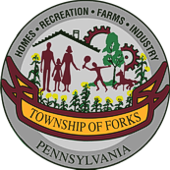 Over the past years the Society has compiled substantial amounts of historical information from the incorporation of Forks Township in 1754 to the present day. One must remember that we were primarily an agrarian society from the time of our founding until recent decades. Industrial areas were mainly along Bushkill Creek where an abundant water supply powered grist mills, distilleries and on occasion sawmills. Several taverns existed within the township at a time when Forks Township's boundaries extended well beyond our current borders. Taverns served as public meeting houses. Forks supervisors conducted township business in a room of a township tavern into the mid-20th century. The Society has assembled a substantial collection of documents, photos and artifacts from property deeds written on sheepskin to farm implements and a 100-year-old merchant wagon crafted by the late Cyrus Graver, a township blacksmith and wagon builder. The wagon has been professionally restored returning it to the original appearance. The Society conducted a fund raising campaign for the wagon restoration, supplemented by a grant from the Pennsylvania Department of Community & Economic Development. 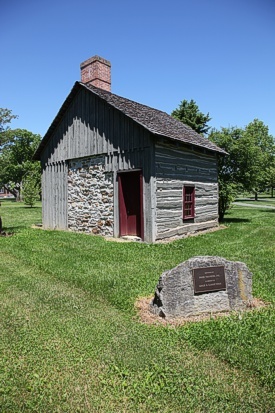 We continue to oversee the historic log cabin situated in our township park. The cabin was the initial home of German immigrants Michael and Gertrude Fraes [Frace] built on Penn Patent Tract #185 in 1766 and remaining in the family for several generations. By 1940, the farm where the cabin was then situated off Frost Hollow Road was purchased by J. Ludlow White and wife naming the property Walnut Lane Farm as there were several walnut trees lining the farm lane. Several of those trees remain to this day along the former lane, now part of the bike path. On occasion teachers at the Forks Elementary School would take their students on a field trip to see the cabin. It was truly a "field" trip as the class trouped across the farm fields to see the cabin. They were greeted by Mrs. White who would be dressed in colonial period costume. The class would be given a tour of the log cabin with its huge fireplace and warming fire. Time passed and ownership of the property changed hands, however some historically minded citizens and township supervisors felt the cabin should be preserved. Several efforts to acquire the structure were for naught. Finally in the late 1980s new owners were willing to donate the cabin to the township provided it was removed from their property. Frick Transfer, a township moving and rigging company came to the rescue and moved the cabin to the township park off Zucksville Road where it may be seen today. In addition Frick donated $30,000 for restoration of the cabin. Historical Society members offer lectures regarding the cabin and tours for school students and organizations. The cabin is open to the public on Forks Community Days in September. The Society has agreed to look after another historic structure in the township, dating to the time of the American Revolution when some Native Americans were hostile toward the early settlers. A substantial stone outbuilding was built over a free flowing fresh water spring providing shelter with an ample water supply while affording protection from hostilities. Currently referred to as the Spring House located in the 3300 block Bushkill Drive. Over the years the farm property where the building is located passed through several hands, eventually acquired by Lafayette College when the college purchased farm acreage from Sidney Beitel. Forks Township Supervisors negotiated an agreement with Lafayette College to maintain the spring house. Forks supervisors in turn accepted the Historical Society's offer to upgrade the surrounding grounds and improve the interior so as to be suitable for public tours. Exterior landscaping was done as an Eagle Scout project. Interior cleanup, sand blasting, roof and fireplace repairs completed with appropriate signage erected. A grant from the Pennsylvania Department of Community Development was obtained contributing toward the repairs. Forks Historical Society meets monthly, the 4th Monday, 7p.m. (except December) at Faith Lutheran Church, 2012 Sullivan Trail, Easton, Pa. 18040. All are welcome. For more information contact Karl Miller at 610-253-1035.